In l782, King Rama I established Bangkok (or Rattanakosin as it was known in those days) as the capital city of Siam (presently Thailand). This vast area covering approximately 108 square kilometers on the east bank of the Chao Phraya River had been selected because of its island-like geographical location, in the hope that it would be well protected from the enemies. Fortunately, Siam did not face any invasion during the entire reign of King Rama I and hence afterwards. As it was a relatively peaceful time, the King later built the Grand Palace with its Temple of the Emerald Buddha, and the Royal Field (Sanam Luang). Many other temples were gradually built in the surrounding areas, forming a nucleus from which originated greater Bangkok city. Rattanakosin island now remains as the old part of the present day Bangkok where many old historical sites are visited by visitors and local people alike. Ta Tien, the sub-district in which Aurum The River Place is situated, is known as one of the oldest and busiest commercial areas of old Bangkok, having access from the river and mainland Bangkok. Here one can still see old shop houses in which owners conduct their family businesses as well as using them for dwelling purposes. Aurum The River Place is a compact size boutique hotel on the bank of the Chao Phraya River. Growing up in this area with the spectacular view in front of us and having lived in this Thai-Chinese community with a fascinating history all of our lives, we decided to turn the 50-year old warehouse into a small hotel where we would be able to share the good, peaceful feeling of being part of this great area with our guests. 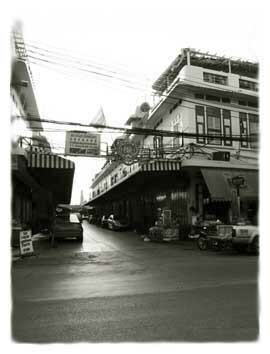 Turn into the small lane bearing the red and white "BANKTHAI" sign and walk a short distance towards the river. You will see Aurum The River Place on the right-hand side and Vivi The Coffee Place directly in front. Imagine the luxurious comfort of a 5-star hotel combined with the understated charm of a cozy inn. Add the relaxed style of a Thai riverside Sala and you have the unique experience that is Aurum. The hotel itself is a 4-storey European style building. Though many regulations governed the construction, we managed to harmoniously craft a stylish, classic boutique hotel equipped with all the modern comforts. High quality bedding, linens and bathroom accessories ensure a luxurious, cozy stay. Here, guests will surely experience the feeling of being at home but with an exquisite river view in front of them. The hotel's name, Aurum, derives from the Latin word for gold. As gold occupies a very special place in Asian people's hearts, we felt it was an appropriate name, especially for a location in the old city. Religion-wise, it is used as a precious substance for building Buddha images; and of course, it is a very sought-after valuable accessory for men and women alike. Aurum's logo, the gold leaf, depicts the Thai traditional way of paying respects Buddha images by pasting the fine gold leaf on them. Aurum The River Place is not just a place to stay, but is also the best way to experience the Thai river lifestyle. It is also an excellent location for seeing several magnificent historical sites, many of which are only a few minutes walk from the hotel.